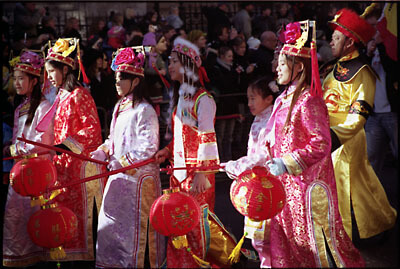 Start the Year of the Ox by celebrating Chinese New Year at London's Trafalgar Square. With traditional dances, cultural stalls, fireworks and stunning live performances, the Trafalgar Square events will draw in a large crowd from many different cultures. The celebrations for Chinese New Year at Trafalgar Square, Chinatown, Shaftesbury Avenue and Leicester Square run from 12pm - 6pm, Sunday 1 February 2009. All events are free to attend. Only one part of a larger series of events on 1 February that also take place in Leicester Square, Chinatown, and Shaftesbury Avenue, the Chinese New Year at Trafalgar Square celebrations will include a show by Chinese acrobatics and dancers. Artists from the Qinghai and Kunming provinces in China will be giving special performances. In the specially decorated Chinatown, there will be lion dance displays as well as chinese food stalls. The nearby Shaftesbury Avenue will become Hong Kong in London for the day and features a stage where local Chinese artists will show off their talents. Starting at 12pm, those celebrating the Chinese New Year at Trafalgar Square will be treated to a colourful spectacle as Chinese dragons, lions and acrobats dance and perform to impress the crowds. There will also be ethnic songs to give everyone a taste of Chinese culture and traditions. As a grand finale to the Chinese New Year London celebrations, there will be a free fireworks display in Leicester Square. Starting at 5.55pm, the Leicester Square fireworks are bound to be a colourful and noisy affair to welcome in the Year of the Ox with a bang. Last updated by Mike on 30 January, 2009 in Travel.